An interview with Abby Hanlon follows below. Information about the giveaway comes the end of this post. I love, LOVE, L-O-V-E Ralph Tells A Story (Amazon Children’s Publishing, 2012), which is a story about a boy, Ralph, who has trepidation about writing. (It’s already become a book I suggest to teachers when I speak about mentor texts!) Ralph is that kid in your writing workshop who claims he doesn’t have anything to write about. He’s the kid who does everything he can to avoid writing. He’s the kid who is an inexperienced writer and just needs the push to get started. You know that kid… the one who has so much to say, but lacks the confidence to put his (or her) thoughts on paper. Abby Hanlon, author and illustrator of Ralph Tells A Story, understands what a primary grade writing workshop looks like. This was evidenced to me by third page spread in the book, which shows what the classroom looks like. It lists “Our Favorite Characters” and has pictures of popular characters like David, Frog & Toad, Madeline, Olivia, and Pigeon. That same page spread shows the teacher conferring with a writing partnership, kids’ desks in groups of four, children in writing partnerships, and kids writing long drafts in focus spots. The kids are even using the kind paper that provides a large box for a picture and a few lines for their words. There’s even a writing center that is on the children’s level that has paper, pencils, and stapler! It’s clear, just from these two pages, that Hanlon gets writing workshop. But it doesn’t end there. Page after page I found myself relishing in the fact that this story is one kids who who are engaged in a writing workshop can relate to. Ralph gets encouragement from his friend Daisy. There is an underlying message that there is value in talking with others about your stories. Hanlon makes it clear that writing isn’t just about the words on the page… writing happens when you think, talk, and draw, too. 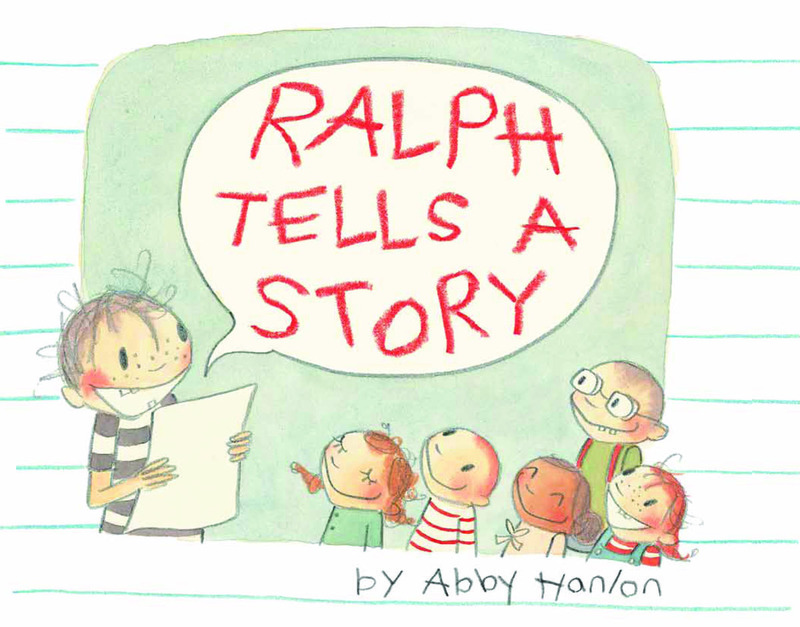 Ralph Tells A Story is a book I know you’ll want to have in your classroom library! Therefore, I wanted to chat with Abby Hanlon so you could get more insight into this book, her inspiration, and her writing process. Stacey: Tell me more about the writing workshop you led for your students. Abby: I was very much like Ralph’s teacher in the book– I was over the moon about my students’ stories. Using Lucy Calkins’ Units of Study for Teaching Writing as my guide, I loved teaching writing and I cherished the sentences that my first graders worked so hard to write. During the mini-lesson, I would write and draw my own story on big chart paper so the kids could observe my thinking and revision process. Like many teachers, this was my first experience since childhood using pictures and words to tell a story, and I found it really challenging. But I think this kind of modeling for young kids is an essential ingredient for a successful workshop. I liked to play classical music to set the mood for writing. The first half of the workshop, when kids were busy getting their story on the page, was probably the only time my classroom was ever quiet. During this quiet period, someone would inevitably spill the crayons and everyone would look up -– that’s why in the book Daisy writes a story about Ralph spilling the crayons. See, stories are everywhere! You can even write about writing workshop! Stacey: What were your three favorite things about teaching writing? Abby: 1. I loved how naturally curious little kids are about a classmate’s story. They take each other’s writing very seriously. I noticed the contemplative expressions on their faces when they are deep in thought about someone else’s experience. 2. I loved the thrill of witnessing a child string letters together for the first time, and then realizing… that he or she can read it! It’s so exciting to watch kids learn to read for the first time especially when it’s their very own writing. 3. I loved building a common language and repertoire of shared stories with my students that we could refer to throughout the year. Just like in a family or a group of friends, it’s the stories that bind us. Stacey: Did you always teach writing using a workshop approach? Abby: I have always used the workshop model. When I was a new teacher at a very under-resourced school in Harlem, I was lucky enough to attend professional development days at nearby Teacher’s College. I would return to the classroom filled to the brim with ideas and inspiration. I loved the workshop model because it allows children to work on their own level, and I could celebrate a child’s individual achievements. I also felt that it was a wonderful opportunity to build community in the classroom. I felt that writing workshop was the most creative and most demanding time of the school day. During the personal narrative units, kids are encouraged to find their own story, to notice and remember the little details in their life and put them down on paper. This is a really big task. For little kids who are just learning to form letters, who are making connections between letters and sounds for the first time, who are figuring out which direction the letters go on the page, writing workshop can be daunting. But watching my students rise to this enormous challenge always amazed me. Ralph Tells A Story is about a little boy who feels pressure in the classroom. Ralph notices what everyone around him is doing and he feels that he isn’t good enough, but ultimately, his desire to communicate overpowers these fears. Learning to write is empowering and that is what I loved most about writing workshop. Stacey: Throughout the book your illustrations made it clear that students were engaged in writing workshop. Why did you choose to make it a workshop classroom? Abby: Yes, the book follows the structure of a writing workshop; the story starts off with inspiration from the teacher, then the children go off to work on their own to write personal narratives and then they come together at the end to share. I wanted to write a book that would be helpful to teachers who use the workshop model. This was the book I wished I had as a teacher. My goal was to create a story that would inspire students when they felt stuck during writing workshop. I realized the best way to inspire kids was through humor. I also wanted children to be able to relate their classroom experience to Ralph’s. I tried to portray the pressure of a classroom, the insecurity of a young writer, and the temptation to distract oneself from a difficult task. I also wanted to show the joy of a classroom and the power of a class coming together to share. I think these themes are pretty universal so I called it “writing time,” for those who have not been exposed to the workshop model. Stacey: Who inspired Ralph and Daisy? Abby: An adorable little boy in my class who had really messy hair inspired Ralph. During writing workshop, he struggled with the basics; holding his pencil, forming letters, writing his name. Drawing was not yet a satisfying way for him to tell a story because his drawing skills were undeveloped. He squirmed in his chair and tried to find every possible distraction to avoid writing. Every day he would declare that he had nothing to write about. But I knew that this was not true, because this kid was funny. The other kids in the class loved him for his silly stories. He just couldn’t write them down yet. I remember one day when it was time to share, I called on him, knowing there was nothing, or very little, on his paper. He stood in front of the class, holding his empty paper, and after his initial unease, he improvised, making up a funny story as he went along, which ended with the class bursting into applause. That was how the idea was born for Ralph Tells A Story. I felt that this boy was a natural hero and a champion of oral story telling, a critical component of writing workshop. Daisy’s character was a composite of kids who would just fly through paper during writing workshop. The variation in writing skills across a class of first graders can be vast and I noticed the pressure that kids felt as they compared their abilities to others. While I had some students who struggled to put a single letter on the page (like Ralph), another kid might have been writing the prologue to a chapter book (like Daisy). In Ralph Tells A Story, I tried to capture this disparity in the relationship between Daisy and Ralph. While Ralph is staring at his blank paper in front of him, Daisy can’t stop finding things to write about, and, ironically, one of her great inspirations is Ralph. As Ralph is lusting over the stapler as a fun distraction, Daisy is busy stapling her thirteen-page book together, only adding to Ralph’s anxiety. Eventually, however, it is Daisy who comes to Ralph’s rescue and aids in his transformation. I watched children go through a big transformation many times in my classroom. Abby: I found Ralph’s perspective to be a natural voice within me. For one, I think I am like Ralph because I tend to be very aware of those around me, and I am easily intimidated (which is probably good that I didn’t go to art school). I think it was easy for me to “get into character” because I am very sensitive to how children experience school. The academic demands we place on little kids today are extraordinary. Struggling in the classroom is an every day issue for many kids and I empathize. Stacey: How do you imagine teachers using the “Writing Tips from Ralph” with their students? Abby: The tips are meant to be funny but also helpful to the extent that I want to acknowledge that writing is hard work, and even though something is hard, you don’t give up. And I want to tell kids, it’s not just hard for you, it’s hard for everyone! I hope that the tips inspire children to reflect upon their own efforts. Humor is a great way to get kids writing, and I hope that teachers will be able to use the book in general to tap into the giant well of kid humor during writing workshop. Stacey: Tell me more about the writing and illustrating process for Ralph Tells a Story. Abby: The writing process was relatively painless. I think because I started with a strong character and narrative, the story sort of wrote itself. My agent supplied great editorial guidance before sending it out to publishers. She had the idea of giving Daisy a larger role, she pushed me to think of a compelling story for Ralph to tell to the class, and in general she encouraged me to “have more fun” with it, which I did. The illustration process, in contrast, was extraordinarily challenging for me. My publisher knew that this was my first project, but I’m not sure they knew how completely inexperienced I was, and the extent to which I was “winging it.” The idea that I was publishing a book that little children would hold in their hands and scrutinize the drawings felt terrifying, and loomed over me as an opportunity that I couldn’t live up to. I think I was in an unusual position, selling a book to a publisher before I was ready as an illustrator. When I started the first round of drawings to show the publisher, I was still not at the point where I could consistently reproduce a gesture or expression of a character. So the illustrating process was largely about repetition — I had to put in a lot of hours in order to gain a steady hand. I was also learning to use watercolor and just beginning the long journey of learning to think visually. Stacey: Did the story change much once you sent it off to your publisher? How did revisions work? Tell me more about the revision/editing process? Abby: I was pleased that the story changed very little once we found a publisher. Because I was a first time author/illustrator, my agent wanted the story to be polished before we submitted it. Then I was lucky enough to have an editor who recognized that most of the substantive work of telling the story was complete. We had about three rounds of back and forth with small edits before she gave me the green light to start the final art. My editor caught some inconsistencies in the story, and made sure that the pictures and the words worked together very clearly. She also noticed things that children might not understand. For example, one thing that we omitted during the editing process was a page where Ralph is covering his paper with staples and daydreaming that his teacher is complimenting him on how well he staples. My editor also added some nice ideas to the book like having the page of writing tips and expanding Ralph’s titles on the end papers. Stacey: I know you taught yourself how to draw. What advice can you give to children or adults who would like to create a picture book but have minimal artistic ability? Abby: I was able to sell my book with minimal artistic ability because the story was strong. So, I guess that is the most important piece – the story matters most. Ask yourself, why is my book important? What am I trying to communicate to children? In terms of illustrating, if you infuse your work with feeling and authenticity, people will want to look at it. Don’t be daunted by the amount of time it may take to achieve this. Stacey: What are some ways you can suggest to teachers to help kids, who don’t want to share their writing, feel safe in front of their peers? Abby: The effort and time you spend the first few months of school to create a community in the classroom will return itself infinitely during writing workshop. Creating a safe space takes a lot of class discussions, role playing, explicitly modeling behavior, holding children to high standards, and of course, the perfect children’s books (like Chrysanthemum). From day one, I wanted my students to feel they were in a very special, protected place. Writing workshop seemed to be the time of the day where children feel most vulnerable. I felt my job was mostly about growing each individual’s self-confidence. I would notice what I was doing to support my students – and then I would explicitly teach those behaviors to them, so that they could support each other. For example, I would teach children how to look at the person speaking, how to ask questions to develop a story further, how to ask questions when they are confused, how to show interest, how to compliment, and how to provide help without hurting someone’s feelings. Lastly, I would say, start the year with lots of opportunities for oral storytelling and continue to make time for it throughout the year. Especially for kids like Ralph, oral storytelling is their entry point into the world of writing. Stacey: Where’s your favorite place to write? To illustrate? Abby: My favorite place to write is at a coffee shop near my house because I am more disciplined there. But I also find that I think very differently “out of the box” of my house. Many of my ideas hit me as I walk around my neighborhood. This is exactly what we teach children – writing is something that also happens away from your desk. Writing is a way of seeing and a way of reflecting about the events in your life. It’s something we do in the bathtub, on the walk to school, when we are putting on our socks. Drawing is the opposite. I like to be home and I like to be comfortable. I’ve noticed that when I draw, I have to make the character’s expression with my own face in order to draw it – so it’s nice to have a private place to work so I don’t look too crazy. Stacey: What are you working on now? Abby: I am working on a chapter book about a little girl who has the opposite of Ralph’s problem. While Ralph has trouble turning it on, this little girl has trouble turning it off. Her stories and imagination encompass her. A huge “thank you” to Abby Hanlon for her thoughtful and detailed answers to my questions! Some kids feel nervous when it comes time for them to share their writing. My heart melted when I saw Ralph’s writing. This giveaway is for a copy of Ralph Tells A Story for one reader. Many for thanks to Amazon Children’s Publishing for sponsoring this giveaway. To enter for a chance to win a copy of Ralph Tells A Story each reader may leave one comment about this post in the comments section of this post. All comments left on or before Saturday, November 10th at 11:59 p.m. Eastern Time will be entered into a random drawing using a random number generator on Sunday, November 11th. I will announce the winner’s name at the bottom of this post by Tuesday, November 13th. Please be sure to leave a valid e-mail address when you post your comment so I can contact you to obtain your mailing address and have my contact at Amazon send the book out to you. Please note: Your e-mail address will not be published online. I love when picture books are enjoyed not only by students, but adults as well. This is certainly a great book for any teacher to add to their collection and share with their class! It’s a great way to add to a Writer’s Workshop. Whether I win it or not, I will most certainly be looking for it in bookstores and recommending it to others! ← A Month of Thanks Begins Today. I wish there was a story like this written about reading and writing in the middle grades as well! Brilliant! Looks like a great book. I will add it to the books I share with teachers as we talk about writers’ workshop. Can’t wait to shre this with teachers across the country to use as new mentor text in Writing Workshop! I am sure they witl LOVE it just as much as I did! I love that this book was written by a teacher who lives through this process with children on a daily basis! Yay! Since we’ve started writing workshop at our school I have seen the number of students who don’t “like to write” decrease dramatically in grades k-2. But once standardized testing gets involved it starts up again..just as in reading when they are told they have to write or read to something they can’t relate to, it becomes a formula. Fortunately the avant garde of prompt writing seems to be waning! What a great story that my third graders will love. I can use this book as a mentor text for several writing mini lessons. Well written and illustrated. Thanks for sharing. I do not need to be entered to win, but I just wanted to add my praise for this book. It is so clear that Abby taught in her own writing workshop. Just a delight – pictures and words both! Access to books to use for young English readers is not easy. I have been taking my students, step by step expanding ideas into sentences and sentences into stories. They are able to do a whole paragraph. I love the pictures! I’m hoping this is my lucky comment 🙂 What a perfect book to share with students! I always love it when we get the backstory of a book. Thanks for bringing this book and author to my attention. Love when a teacher is abled to publish a children’s book!! Congrats Abby! Perfect for my Reader’s and Writer’s Workshop classroom! This sounds like an absolutely adorable book! Love the author interview. I’m fascinated by the different work habits of writers – loved how Abby Hanlon noted that she can write pretty much anywhere but needs to be home to draw. So interesting! Beautiful book for edifying journeys with growing writers…Thank you so much for continuously guiding us to such incredible books! I’ve been trying to get my hands on this book for weeks from my local library. I may have to just expedite the process! Thanks for the author interview – I love learning more about the story! Can’t wait to get this book. What a great interview, as well. Thank you! The illustrations are even better than the text for me! Wowza! I am now rearranging my days activities so I can make a trip to the library. I already checked, one copy in stock! Then I will patiently wait to see who is the lucky recipient of the giveaway. My favorite words from the interview, “champion of oral story telling.” Oh, how I love the recognition of the importance of talking and how it veined through this whole post. Lovely. Thank you so much for sharing her words and yours along with this book. Oh my goodness! I have to get my hands on this book! I have had Ralph in my class before…as a matter if fact, I have a couple right now! I am so eager to share this book with my students. Thank you for sharing it. The interview is also great. I enjoy hearing the writer’s thoughts. Abby says, “This is the book I wish I had as a teacher.” I wish I could have it, too! I plan on ordering this book for our mentor text collection. Thanks for sharing. I’m so thankful for this post! I can’t wait to get this book and reading Abby’s thoughts on WW was a treat. I’m a kindergarten teacher and writing workshop is my favorite time of the day. Definitely sounds like a good that needs to be in teachers’ repertoires. I appreciated the reminder of how important oral story telling is. Thank you for the interview! Can’t wait to use this in my classroom next week. I am sharing the article with my fellow teachers. Thank you. I’ve just found the book to share with all of my writers workshop groups across our district. Thanks for the interview and snippets of the book. I’m even going to try it at high school. Thanks for writing such a relevant book! I will definitely be adding this to my wish list! I think even older elementary students can relate to Ralph. Thanks for introducing Abby to us. I enjoyed hearing about her writing and drawing process. The illustrations are precious, Abby. Thanks for sharing your talents with us. What a fantastic mentor text! I would like to share this text with my grade level team and my students. I’d like to share this book with my (middle elementary) students, and then pass it on to my primary colleagues! This sounds perfect to use with beginning writers! I can’t wait to find it and share with other teachers in my building. What a great book to use for Writer’s Workshp! Love the interview as well! THis is a great post, and the book looks like a great mentor text. Thanks! I love the idea of using this book to teach writing. Thank you for sharing. I cannot wait to get my hands on this book and share it with my kindergarten class. Thank you for sharing! I am a literacy coach in a K-3 building. After a recommendation from one of the teachers I work with, I ordered the book to add to our read aloud collection in the building. Before I could even put a label on it, it disappeared off the table! A teacher couldn’t wait to share it with her class. A wonderful book to use with Writing Workshop…or just to read! This seems like a great book to use as children can relate to the story. Finding good books about Writer’s Workshop is difficult, so thank you for sharing this with us! I love the idea behind this book and cannot wait to share it. I cannot wait for the giveaway! I can’t wait to get my hands on this book! I know a couple of second graders who might identify with Ralph. It sounds like a book any teacher would want in her library. I’ve been feeling a lot like Ralph lately during writers workshop! Seems like I’m the fidgety one, struggling with nothing to write about. I want this book for me! And for my first graders too, of course. It sounds just delightful and I think we can all see a bit of ourselves in both of the main characters. I love the idea of teachers who are published writers though I think we can write stories for our students that have a similar purpose as this book without necessarily getting published. I know that’s not my game plan and that’s OK. However, I can see doing a similar thing on a smaller scale. I hope I win this, but if I don’t I’ll probably go out and buy it for myself. It’s the perfect book to use during writing workshop! I feel like this blog was written just for me! It came at the moment that I was looking for something like this to use with our young writers! Can’t wait to use this. I am sharing the article with my fellow teachers. Thank you. I am so excited about this book! You are right, it is a perfect mentor text! Thanks for sharing it! Thank you for this fabulous interview! I’ll be sharing it with my colleagues and asking our librarian to order at least one copy of this story. Wonderful interview, Stacey. I love the way Abby incorporates so many good things about writer’s workshop into her book. It sounds very special. I am in the midst of conversations with our primary teachers about mentor texts and genre studies, so I know they will love this book, and the post! Thank you! I love Ralph. I teach 6th graders and love to share picture books to inspire my students. Several students come to mind who share the writing experiences with Ralph. Thank you so much for your wonderful suggestions. 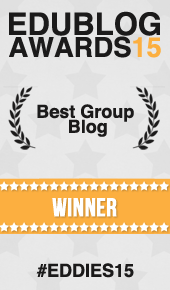 Your blog has made me a better supporter of the curriculum, a better librarian, a better writer. I hope I win! I’ll share with our Curriculum coordinator! I am a Reading Consultant/literacy coach on Deep River, CT! I love this book! If I don’t win it, I am buying it right away and getting a copy for my K-2 teachers! Thank you!!!!! What a great text to use in the classroom. Thanks for bringing it to my attention.